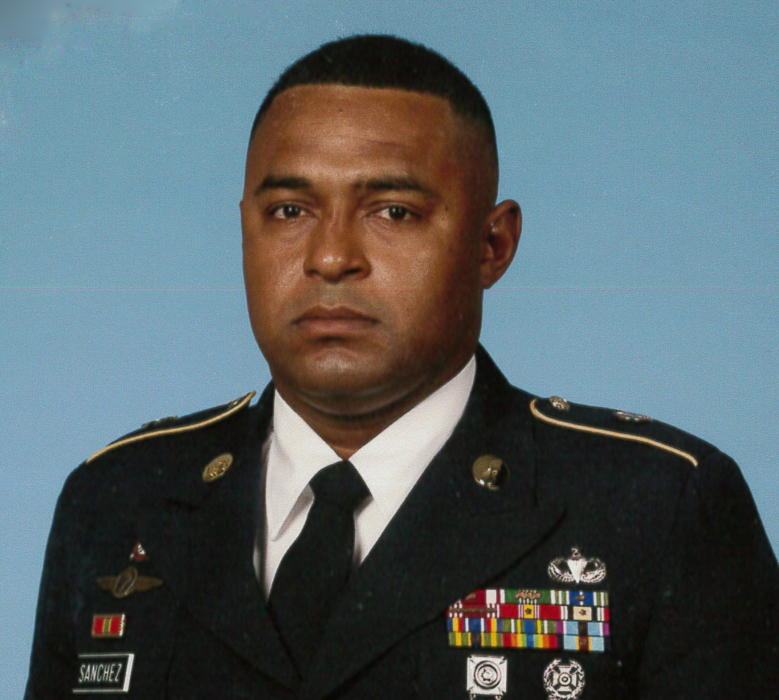 MSG Enrique Sanchez, 45 of Crestview, Florida, earned his wings March 26, 2019. He was born, December 8, 1973 in Panama City, Panama to Leida Jackson. In 1998 he married Crystal Sanchez in Fayetteville, North Carolina. He began school in Panama at Manuel Jose Hurtado. He also went to Busbee Middle School and Brookland Cayce High School in Columbia, South Carolina. He also attended Fayetteville State University and Troy University. MSG Enrique Sanchez entered the United States Army on June 4, 1992 as a Quartermaster and Chemical Equipment Repairer. Over the course of a distinguished 26-year career, he had the opportunity to live in several places like Colorado, South Carolina, Texas, Korea, North Carolina, Maryland, Virginia, Florida. MSG Sanchez has served as a Field Recruiter, Brigade Maintenance Manager, Brigade Air Operations Sergeant, Senior Platoon Sergeant, Battalion Motor Sergeant, and Senior Maintenance Supervisor, among other positions. He deployed to Iraq with the 82nd Airborne Division, and to Afghanistan with 2nd Battalion, 7th Special Forces Group (Airborne), and served overseas in Korea, Columbia, and Peru. His military education includes: The Basic Leader Course, Recruiting Management Course, Static Line Jumpmaster Course, Unit Prevention Leader Course, Advanced Leader Course, Senior Leader Course, Battle Staff Course, AIT Platoon Sergeant Course, Equal Opportunity Leaders Course, Master Driver Training Course, Sling Load Inspector Certification Course, and Army Contracting Officer Representative Course, and many others. His awards and decorations include the Bronze Star Medal, Meritorious Service Medal with three oak leaf clusters, Army Commendation Medal with three oak leaf clusters, Army Achievement Medal with one oak leaf cluster, and other unit and service awards. He has earned the Master Parachutist Badge. He is survived by his wife, Crystal Sanchez; daughters, Jasmine and Taina Sanchez; His mother, Leida Jackson; step-father, Carl Jackson; brothers, Miguel (Courtney) Jackson and Joseph (Octavia) Jackson; sister, Angela (Nate) Johnson; uncles, Ito Kim Severin, Adolfo Sanjur, and Efrain Sanchez; nieces, Znariah, Serenity, Harmony, Summer, and Melody; nephews, Jeremiah, Jacoby, and Jacob; his mother in law, Coral (Melvin) Davis; father in law, Lassiter Curry; sister in law, Arlisha Curry. He was preceded in death by his grandmother; Aida DeGracia, grandfather; Enrique Sanchez. A time of visitation will be held at 1:00 pm on Saturday, March 30, 2019 at Lifepoint Church, at 400 S Ferdon Blvd, Crestview, FL 32536, followed by a funeral service at 3:00 pm. A military memorial will be held at Fort Jackson National Cemetery on Friday, April 5th, 2019 with full military honors.